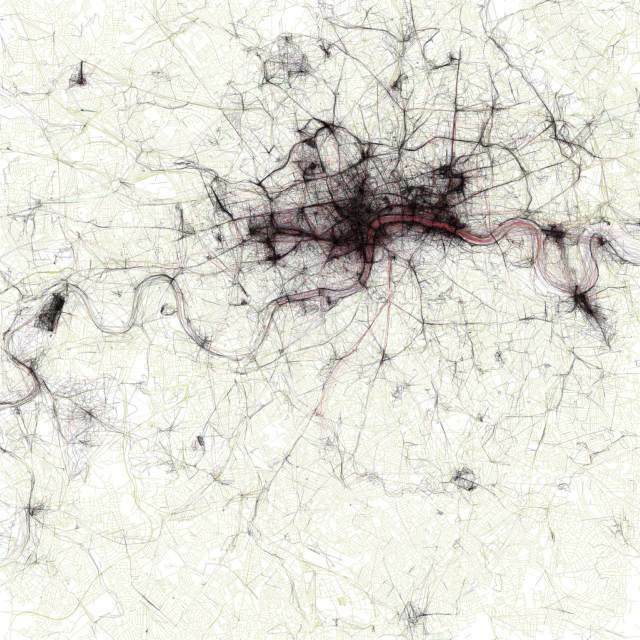 Which Bits Of London Get Photographed The Most? M@ Which Bits Of London Get Photographed The Most? Big Ben? Possibly. London Eye, probably. Canning Town, probably not. It's easy to make guesses at the most photographed locations around town, but the rise in geolocated imagery now provides actual data. Eric Fischer has used over 73,000 photos from Flickr and Picassa, overlaid on an OpenStreetMap layer, to generate this view of London (larger image here). Naturally, the West End, South Bank and Tower Bridge areas resemble a haemorrhaging Etch-a-Sketch. There are clear peaks in the City corresponding to St Paul's, Monument, and the Gherkin. Photogenic spots outside of the centre are also represented, such as Greenwich and Kew. And we presume that's Wembley to the top left. Eric has extended the idea to many cities around the world in his Geotaggers' World Atlas. With thanks to @jezbravo for the tip.